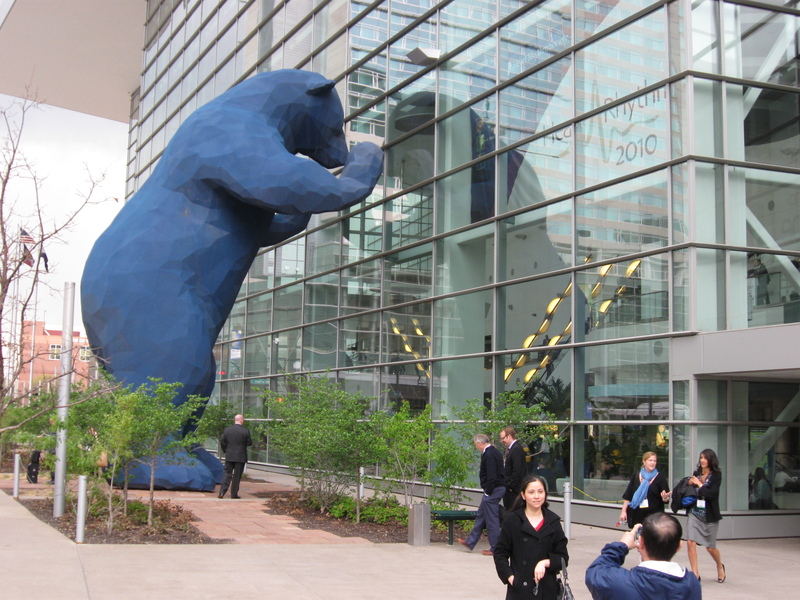 Physicians planning to attend the upcoming annual meetings of the American Academy of Family Physicians, Society of Diagnostic Medical Ultrasound, or American Public Health Association at Denver’s Colorado Convention Center should prepare the mselves for Shock and Awww when they encounter the big blue bear, a whimsical 40-foot tall sculpture peering through the glass to see what’s going on inside. The sculpture by British-born University of Denver artist Lawrence Argent is titled, “I See What You Mean.” Commissioned under the city’s 1%-for-public-art program, the big blue bear weighs 10,000 pounds and is composed of more than 4,000 polymer and concrete interlocking triangles over a steel frame. Argent began with a small plastic toy he scanned and converted into a digital computer file, which he then sculpted electronically. The big blue bear has become a popular, feel-good tourist attraction. It also serves as a convenient meeting point for conventioneers who become disoriented by the conference center’s long, white, largely unmarked corridors.